Copyright: © 2017 Muthia RL et al. This is an open-access article distributed under the terms of the Creative Commons Attribution License, which permits unrestricted use, distribution, and reproduction in any medium, provided the original author and source are credited. The growth of Islamic banking cannot be separated from the Intellectual Capital (IC) of its resources, not only from tangible assets but, also from intangible assets derived from Human Capital (HC), Structural Capital (SC) and Relational Capital (RC)/Customer Capital that will form the Intellectual Capital. This study aims to analyse the IC development model to increase the performance of Islamic banking in Indonesia. The data was collected from the director of Islamic banking in Indonesia, with data collected from as many as 120 respondents. The hypothesis was tested by using Structural Equation Modeling (SEM) together with the Amos program. The empirical results reveal that the IC component has a positive and significant effect on the performance of Islamic banking in Indonesia. A relationship exists between the two elements of the IC component, specifically Human Capital (HC) and Relational Capital (RC) in relation to the performance of Islamic banking, while Structural Capital (SC) has no influence on Islamic banking performance. Furthermore, HC has a higher impact on Islamic banking performance compared with RC. The 21st century has so far been marked by changes in the business environment that have occurred do wing to advances in information technology, intensity of competition and outstanding innovations which have resulted in numerous companies changing their way of conducting business. Companies now realise that to survive, they must change from being a labor-based business (business based on labor) to knowledge based business (business based on knowledge). Therefore, to increase its competitive advantage, it is compulsory for a company to implement knowledgebased business management. Knowledge-based business is a business that is run by utilizing intellectual capital more. The banking sector is one of the sectors that intensively utilize their Intellectual Capital assets. Banking is an industry that is fraught with risks, ranging from fundraising (source of funds) to fund distribution (allocation of funds) on productive assets, as well as various service activities that are fraught with risk, such as online banking. There are several challenges that must be resolved to improve the quality of sharia banking. According to the Deputy Governor of Bank Indonesia, Dr Halim Alamsyah, several challenges must be resolved, for instance the human resources compliance gap, both in quantity and quality, innovative product development and sharia banking services that are competitive based on community needs and the continuity of outreach programs and education in partnership with the community. Such conditions can be anticipated with the development of Intellectual Capital in sharia banking, such as the readiness of facilities and infrastructure that are not only material but also non-material, to create human resources that can build and develop sharia economics in the future (Alamsyah, 2012). There is no doubt that successful companies tend to be those that continually innovate, relying on modern technologies and moreover, emphasize the skills and knowledge of their employees rather than assets, such as plants or machinery. Knowledge being the new engine of corporate development has become one of the great methods of recent years, given that value can be generated by intangibles assets. In realizing the goals of a progressive and dynamic sharia banking sector and the desire to become a knowledge-based economy, greater effort must be directed to creating Human Intellectual Capital (Lepak and Snell, 1992). Several researchers have conducted studies on the relationship between Intellectual Capital and company performance. As an example, research conducted by Chen, using data from listed companies in Taiwan proved that Intellectual Capital has a positive effect on company performance , whereas research conducted by Ulum, revealed a positive relationship between Intellectual Capital and corporate performance . Additionally, research conducted by  concerning the influence of Intellectual Capital on Islamic financial performance in Sharia banks in Indonesia, showed a meaningful relationship between Intellectual Capital and Islamic financial performance. Even though Intellectual Capital has been recognized as a wealth driver for companies, there are many issues that are still being debated. In addition to the issue of the development of measurement models that best explain the invisible or hidden values of businesses, various attempts have been made by companies and countries to develop an intellectual capital disclosure framework to reflect values, particularly in the sharia banking sector. Conversely, it is not evident whether certain types of companies are more likely to focus on managing intellectual capital, or if they do, do they view Intellectual Capital as a mission-critical resource and attempt to manage it accordingly? . Therefore, the purpose of this paper is to analyse the relationship between intellectual capital measures, particularly in Sharia banking. Thus, we propose that a positive relationship exists between sub-constructs of Intellectual Capital, i.e. Human Capital, Structural Capital, Relational Capital and business performance regardless of the Islamic banking industry in the context of Indonesian sharia banking. Intellectual Capital composed elements of Human Capital and Structural Capital, as an intangible asset and capital employed as physical assets may possibly increase the value of a company if they are applied in an efficient and appropriate manner. According to Sumedrea, the relationship between the components of Intellectual Capital can influence a company's performance . Figure 1 demonstrates the relationship between IC components and company performance. Figure 1: Link between intellectual capital and organisational performance . The empirical literature reveals that Intellectual Capital (IC) encourages the business performance of organisations. A study was conducted to measure the effect of Intellectual Capital on business performance. Several scholars have argued that IC has a significant and positive impact on performance [6-11]. According to Rehman et al., Intellectual Capital (IC) is one of the most important strategic assets in a knowledge based economy . Intellectual Capital has a few definitions, as it acknowledges the fact that both knowledge based and economic based approaches exist. A knowledge economist defined by the Organisation for Economic Co-operation and Development, as that where production and its distribution in conjunction with knowledge is a primary force for creating growth and wealth . Furthermore, human intellectual ability is a key intellectual and strategic asset which enables businesses to increase their efficiency as shown in Table 1. Table 1: Definitions in Relation to Intellectual Capital. Bontis (1998), (1999) [14,15] IC is elusive, although once it is discovered and exploited, it may provide an organisation with a new resource-base from which to compete and win. IC is the pursuit of the effective use of knowledge (the finished product), as opposed to information (the raw material). Brooker et al., (1996) IC is the term given to the combined intangible assets of the market, intellectual property, human-centred and infrastructure – which enable the company to function. Ross et al., (1997)  IC includes all the processes and assets which are not ordinarily revealed on the balance-sheet and all the intangible assets (trademarks, patents and brands), which modern accounting methods consider it includes the sum of the knowledge of its members and the practical translation of his/her knowledge. HC is an important variable in the study of Intellectual Capital. It is the dimension of Intellectual Capital which deals with human knowledge and its experience, which is based on other elements and which will influence a company’s value by affecting the other element [14,15]. Human Capital is the skill and creativity of employees that can be encouraged further by investing more in their training programs. The literature confirms that successful companies always invest in HC to develop their overall working capabilities and environment . Therefore, it is important to verify empirically whether HC has a direct relationship with business performance. SC is an additional important determinant of IC. It consists of all non-human assets. Additionally, as argued by Bontis et al., it is recognised as all the systems, procedures, databases, copy rights, patents, structural procedures, rules and policies that are important regarding decision making and which supports their business activities and processes . The term Relational Capital is explained as the relationship between companies and their customers. This is a significant dimension which influences the inward relationships of an organisation and the customer or external stakeholders . Furthermore, it is the cumulative trust, experience and knowledge that form the core of the relationship between businesses and their customers. If the organisation cannot measure performance, they cannot manage their business . If organisations are to survive and flourish in a competitive environment in the information age, they must use measurement and management systems derived from their strategies and capabilities. This statement summarizes the necessity of performance to measure, and as a direct consequence, to evaluate . Summarizing the ideas of many authors, it can be said that the roles of business performance evaluation are to ensure compliance with crucial minimum standards, to establish how well organisations are performing, to test strategic assumptions, and to provide a reliable basis for communicating with interested parties . As an addition, the size of a company's success can be seen from the company's financial performance. The financial performance of the tangible results achieved by a business entity in each period can reflect the financial soundness of a specific organisation and can be used to demonstrate the achievement of positive results. Furthermore, profitability, productivity ratio and market value measure the performance of banks . H1: Human Capital has a positive relationship on a company’s performance with regards to Indonesia sharia Banking. H3: Customer Capital has a positive relationship on a company’s performance with regards to Indonesia sharia Banking. The study shown in Figure 2 employs content analysis to measure the performance of Intellectual Capital related to Indonesian sharia banking. The components of Intellectual Capital(IC) used in this study, refers to Bontis et al., specifically Human Capital (HC), Relational/Customer Capital (RC), and Structural Capital (SC). Human Capital includes: knowledge, education, skills, competencies, knowledge sharing, knowledge creation and innovation. Relational Capital includes brand, customers, customer satisfaction, company names, distribution channels and business collaboration. While structural capital includes business collaboration, information systems and networking. The design of the questionnaire for this research required an extensive range of measures and items . The items have been collected and adopted from the IC questionnaire developed by Bontis, originally administered in Canada in 1998. The respondents are the directors of sharia banks located in Jakarta and Bandung. It consists of 11 sharia banks in Indonesia, with as many as 405 branches which would be targeted samples. Data will be collected by means of a quantitative survey approach and the questionnaire will be distributed among the 250 directors of branch offices. It is worth noting that out of 250 questionnaires sent by mail, only 120 questionnaires were returned. This meant an extremely low response rate of only 25%. Hypothesis testing was conducted by means of data analysis SEM-AMOS 22. The study was conducted by distributing questionnaires to 120 operational/branch offices of 11 Islamic banks in Indonesia. Table 2 indicates that that the average score of Islamic banks in relation to Human Capital, Structural Capital and Customer Capital demonstrate a superior performance, with the highest value in Customer Capital and the lowest value in Structural Capital. When examining average performance productivity, profitability and prospects are also noted to perform relatively well. Table 2: Description of Statistics. Measurement models are part of SEM models consisting of latent variables (constructs) and several manifest variables (indicators) that describe the latent variables. The purpose of testing is to determine how precise the manifest variables can explain that there are latent variables. Further testing may be performed by testing a model’s GFI (Goodness of Fit Index) and AGFI (Adjusted Goodness of Fit Index). Theoretically, GFI and AGFI numbers ranging from 0 to 1, with the guidance that results related to GFI and AGFI which are close to 1, indicate that the model is better at explaining the data. Regarding the measurement model with the components of Intellectual Capital and performance, even when testing normality conducted univariate and multivariate, there are several indicators that should be excluded from the model. This is due to the insignificant value of the loading factor of 0.05 resulting in the model fit in the Confirmatory Analysis Test (CFA) not being obtained (Table 3). Table 3: Model Fit CFA. After confirmatory analysis is completed, seeing as so many indicators are used, the composite indicator for each variable is tested. Therefore, the results of the calculation of the composite indicator are applied to test the Second Order Confirmatory as shown in Figure 3 with the following results. Figure 3: Second order confirmatory. 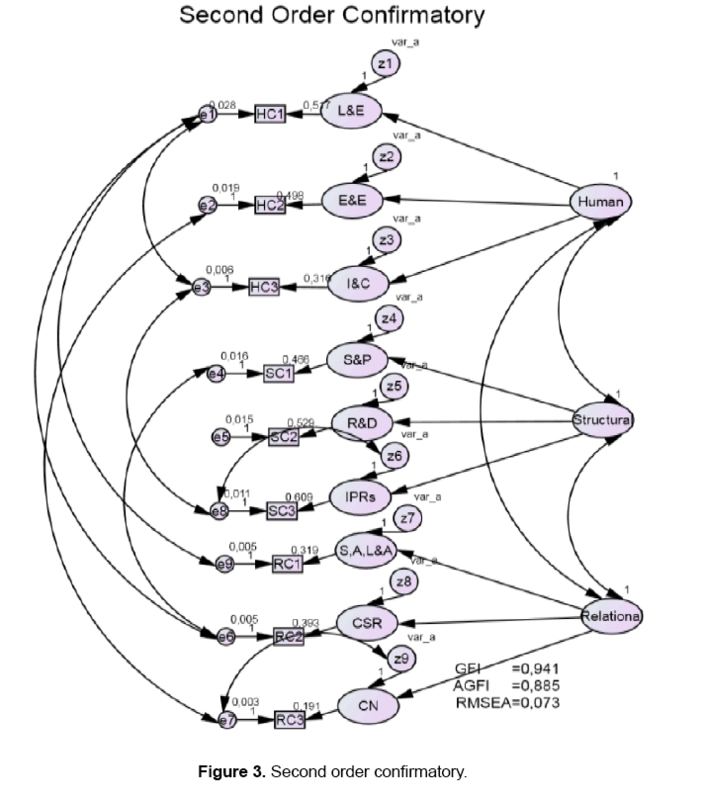 Based on the results obtained from the Second Order Confirmatory, as seen in the illustration above, it is known that the model can be continued to the following stage because the model fit has been obtained from analysis of the Second Order Confirmatory. After the Second Order Confirmatory, which means the stages in the measurement models have been completed. The subsequent stage that must be accomplished is testing the structural model. The results of the structural model test are shown in Figure 4. 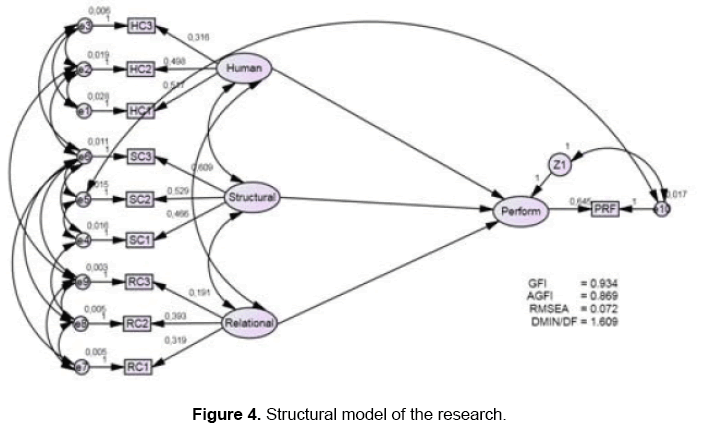 Figure 4: Structural model of the research. It can be concluded from Figure 4 and Table 4 that the dimension of Intellectual Capital which has a significant influence on the Business Performance of the company is the dimensions of Human Capital and Relational Capital. Meanwhile, the Structural Capital dimension does not have a significant influence, given that it has a probability of 0.234 which signifies that it is greater than 0.05. The results illustrate that from the two dimensions of Intellectual Capital (Human Capital and Structural Capital), it can concluded that Human Capital has the greater impact on the performance of Islamic banking, with a loading factor value of (Unstandardized=0419; Standardized=0.346) shown in Table 5. Table 5: Standardised Regression Weights. Owing to globalization, organisations are increasingly confronted with wide-reaching competition. To build and sustain their competitive advantage, and the knowledge and expertise of an organisation, employees need to be viewed as a critical strategic resource. The aim and research issue of this study was to investigate the impact of the three dimensions of Intellectual Capital on the business performance of the Islamic banking sector in Indonesia via empirical research. It appears that the present study has several practical implications for research and practice. It creates awareness of the status of Intellectual Capital among practitioners within the banking sector. Human Capital has a significant effect on the performance of Islamic banking. One important key to maintaining the quality of the performance of the Islamic banks is to develop and educate employees on an ongoing basis. The results reveal that Human Capital has a significant effect on the financial performance of Islamic banking. This indicates that Islamic banks have a strong commitment to improving the quality of human resources (HR). It is worth mentioning that in relation to Islamic banking, Human Capital with tacit knowledge can create value (value creation) for banks. The essence lies in the Human Capital intelligence officials. With creativity and intelligence, employees could undertake their work in the best way. Due to this entire effort, employees can make Islamic banks different compared to conventional banks. The results suggest the importance of including the human element in value creation with in the banking industry; hence, managers in banking need to pay considerable attention to their human capital . This study provides confirmatory evidence of the dominance of the Human Capital aspect on the company’s performance. We suggest that defining Human Capital as part of Intellectual Capital assists organisations to understand how employees create value. As individuals, employees do not meet the requirements of a strategic asset because they easily transfer from one organisation to another. Employee productivity depends on a complex combination of factors (e.g., motivation, rewards, skill level, experience and even emotion) and organisational support. As the result demonstrated, only Human Capital has a positive significant effect on business performance. This is also consistent with the findings of prior studies[7,25-30], where human resources are significantly associated with company performance. The study has indicated that Human Capital Efficiency scores over the study period contributed approximately two thirds to the value of Intellectual Capital. This suggests that Human Capital is a more crucial factor than Physical Capital with respect to banks . The result agrees with the fact that although Physical Capital is essential for banks to operate, it is Intellectual Capital that determines the quality of service provided to customers . Therefore, managers in the banking sector, especially in sharia banks need to pay attention to their workforce to ensure operational buoyancy. Furthermore, Latif et al., who undertook a comparative study on Islamic and conventional banks, established a significant association between Human Capital Efficiency and almost all variables of corporate performance, in the case of Islamic banks, and a significant relationship between Capital Employed Efficiency and all variables of company performance in the case of conventional banks . It means that Human Capital Efficiency is the principal predictor in relation to the corporate performance of Islamic banks, while Capital Employed Efficiency is the primary predictor of corporate performance in conventional banks. Additionally, the finding further reveals that only Human Capital has a significant impact on business performance. The research concludes that there is a significant positive relationship between Human Capital and business performance. In contrast, structural capital does not have a significant effect on the performance of Islamic banking in Indonesia. These results contradict the results of research conducted by Bontis in 1998, which ascertained that there is a positive and significant relationship between structural capital with company performance . Moreover, this demonstrates that the efforts of Islamic banking have not been able to codify company knowledge and further develop Structural Capital by implementing more ideas and develop new products compared to conventional banking. The absence of a structural influence on the performance of Islamic banking capital indicates that Structural Capital has not been able to meet the routine banking process to produce optimal performances from banks. The reason for this could be due to the fact that many managers in developing countries like to invest heavily in Human Capital without providing an adequate and proportionate organisational structure and Physical Capital to work with. As a result, Structural Capital deteriorates and leads to a reduction in the overall performance of Intellectual Capital in addition to business performance. To increase the company's competitive advantage, it is suggested that the business increases elements of Structural Capital by improving the information technology infrastructure by expanding the network of Automated Teller Machines (ATM), as well as develop new products in order to have a greater impact on improving the company's performance. The results reveal the influence of relational capital on the performance of Islamic banking. Additionally, the results support previous research conducted by Bontis , who determined that Customer Relationship Capital in conjunction with business performance is positive and significant . Islamic banking in Indonesia should begin to build relationships with their customers to create value. It is also worth noting that strategic policies the company has initiated have begun to create a market orientation and started to give priority to consumer satisfaction. It is essential that relationships with consumers are maintained, and that they are involved in decision-making, as this will enable the company to achieve success. Islamic banking should consider improving corporate performance from the perspectives of Human Capital and relational capital, because these two variables have a significant effect on the performance of Islamic banking. Scientifically the study contributes to existing literature regarding the performance of Intellectual Capital, specifically concerning developing countries which have the same problem and limitations [33,34]. In addition, it serves as a useful reference for future research especially relating to the Islamic banking sector. The current study has its limitations in terms of its sample (only 120 respondents). Therefore, it is unfair to generalise the findings to all sharia banks; hence, the external validity is extremely weak. This is due to the difficulty in obtaining relevant information from all the companies. For future research, it is recommended that more companies should be used and the number of samples is increased [35-39]. Moreover, it can also compare other measures of Intellectual Capital such as the VAIC model and to determine more valuable output. Chen MC, et al. An Empirical Investigation of The Relationship between Intel­lectual Capital and Firm’s Market Value and Financial Performance. Journal of Intellectual Capital. 2005;6(2):159-176. Ulum I, et al. Intellectual Capital and Financial Performance of Corporate Finance; An Analysis with Partial Least Squares Approach (Intellectual Capital dan Kinerja Keuangan Keuangan Perusahaan; Suatu Analisis dengan Pendekatan Partial Least Squares). University of Tanjungpura Pontianak, Indonesia; 2008. Prasetya DN and Siti M. Intellectual Capital Influence Analysis on Islamic Bank Syariah Islamic Financial Performance Index in Indonesia. Diponegoro university journal. 2011;1-28. Usoff CA, et al. The importance of intellectual capital and its effect on performance measurement systems. Managerial Auditing Journal. 2002;17:9-15. Sumedrea S. Intellectual Capital and Firm Performance: A Dynamic Relationship in Crisis Time. Procedia Economic and Finance. 2013;6:137-144. Bontis N, et al. Intellectual capital and business performance in Malaysian industries. Journal of Intellectual Capital. 2000;1(1):85-100. Goh CP. Intellectual capital performance of commercial banks in Malaysia. Journal of intellectual capital. 2005;6(3):385-396. Tan PH, et al. Intellectual capital and financial returns of companies. Journal of Intellectual Capital. 2007;8(1):76-95. Ahangar RG. The relationship between intellectual capital and financial performance: An empirical investigation in an Iranian company. African Journal of Business Management. 2011;5(1):88-95. Sofian S, et al. The implications of intellectual Capital on performance measurement and corporate performance. Journal of humanity 2005. Riahi-Belkaoui A. Intellectual Capital and Firm Performance of U.S. Multinational Firms. Journal of Intellectual Capital. 2003;4(2):215-226. Rehman WU, et al. Intellectual Capital Performance and Its Impact on Corporate Performance: An Empirical Evidence From Modaraba Sector of Pakistan. Australian Journal of Business and Management Research. 2011;1(5):08-16. OECD. The Knowledge-based Economy. Organisation for Economic Co-operation and Development, Paris; 1996. Bontis N. Intellectual capital: an exploratory study that develops measures and models. Management Decision. 1998;36(2):63-76. Bontis N. Managing organizational knowledge by diagnosing intellectual capital:framing and advancing the state of the field. Int J Technol Manag. 1999;18(5-8):433-462. Roos J, et al. Intellectual Capital: Navigating in the New Business Landscape, Macmillan Publishers, Basingstoke, UK; 1997. Buren VM. Virtual coffee klatch. Technical Training. 1998;9(5):42-46. Wang WY and Chang C. Intellectual capital and performance in causal models Evidence from the information technology industry in Taiwan. Journal of Intellectual Capital. 2005;6(2):222-236. Makki MAM, et al. Impact of Intellectual Capital on Shareholders Earning. Aust J Basic Appl Sci. 2009;3(4):3386-3398. Hsiu-Yueh H. Knowledge Management and Intellectual Capital. Dissertation for Ph.D. Department of Management in the Graduate School Southern Illinois University Carbondale. 2006. Kaplan RS, Norton DP. The balanced scorecard: Translating strategy into action. Harvard Business School Press, Boston, USA; 1996. O’Reilly M, et al. ISO 14031: effective mechanism to environmental performance evaluation. Corporate Environmental Strategy. 2000;7(3):267-275. Coelho C, et al. Non standardized assessment approaches for individuals with traumatic brain injuries. Semin Speech Lang. 2005;26(4):223-241. Keown AJ, et al. Fundamentals of Financial Management (Dasar-Dasar Manajemen Keuangan). Penerbit Salemba, Jakarta, Indonesia; 2005. Mohiuddin M, et al. An Exploratory Study on Intellectual capital Performance of the Commercial Banks in Bangladesh. The Cost and Management. 2006;34(6):40-54. Mavridis DG. Intellectual Capital Performance Drivers in the Greek Banking sector. Management Research News. 2005;28(5):53-62. Kamath GB. The intellectual capital performance of Indian banking sector. Journal of Intellectual Capital. 2007;8(1):96-123. Muhammad NMN and Ismail MKA. Intellectual Capital Efficiency and Firm’s Performance: Study on Malaysian Financial Sectors. Int J Econ Finance. 2009;1(2):206-212. Joshi M, et al. Intellectual capital performance in the banking sector: An assessment of Australian owned banks. Journal of Human Resource Costing & Accounting. 2010;14(2):151-170. Firer S and William SM. Intellectual Capital and traditional measures of corporate performance. Journal of Intellectual Capital. 2003;4(3):348-360. Yalama A and Coskun M. Intellectual capital performance of quoted banks on the Istanbul stock exchange market. Journal of Intellectual Capital. 2007;8(2):256-271. Latif M, et al. Intellectual capital efficiency and corporate performance in developing countries: A comparison between Islamic and conventional banks of Pakistan. Interdisciplinary Journal of Contemporary Research in Business. 2012;4(1):405-420. Abeysekera I. Intellectual capital reporting between a developing and developed nation. Journal of Intellectual Capital. 2007;8(2);329-345. Khan H and Ali M. An empirical investigation and users perceptions on intellectual capital reporting inbanks: Evidence from Bangladesh. Journal of Human Resource Costing and Accounting. 2010;14(1):48-69. Booker LD, et al. The relevance of knowledge management and intellectual capital research. Knowledge and Process Management. 2008;15(4):235-246. Gutrie J and Petty R. Intellectual Capital: Australian annual Reporting practices. Journal of Intellectual capital. 2000;1(3):241-251. Kamal MHM, et al. Intellectual Capital and Firm Performance of Commercial Bank in Malaysia. Asian Economic and Financial Review. 2012;2(4):577-590. Youndt MA and Snell SA. Human Resource Configurations, Intellectual Capital, and Organizational Performance. Journal of Managerial Issues. 2004;16(3):337-360. Ulum I. Intellectual Capital, Conceptual and Empirical Study. Graha Ilmu,Yogyakarta, Indonesia; 2009.